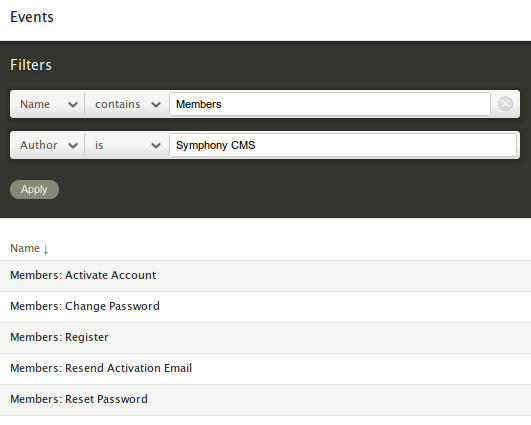 “Events, Datasources & Utilities Indexes” – Forum Thread – Discuss – Symphony. This is an open discussion with 58 replies, filed under Extensions. A new extension, “Events, Datasources & Utilities Indexes” is now available for download. Comments and feedback can be left here but if you discover any issues, please post it on the issue tracker. Based on Rowan Lewis’ Data Sources Index, this extension covers pretty much everything requested in this thread. w00t! Thanks eKoeS, this will go next to Globals and File Manager as a standard for my installs. There’s no way to remove the “Components” item from the “Blueprints” menu (DOMDocument doesn’t seem that safe here). These have all been fixed with a proper use of NavigationPreRender (thanks, Nick) and AdminPagePreGenerate. Furthermore, the extension is now able to redirect you to the correct index page after deleting a resource (i.e. datasource, event or utility). Added the ability to sort Datasources and Events by Name, Source or Author. It is now possible to filter the results by name, source, pages and author. There’s no limit on the number of filters. I have to say filtering is still in alpha. I’d like to add some features such as instant search, autocompletion, filters reordering and so on before considering it complete. Added a new mode “empty” to find results that have an empty field (this is useful to get a list of unused datasources, for example). With the addition of AJAX it is now possible to get a list of existing Sections and Pages when the filter mode is set to “equals”. This makes the formulation of queries a bit quicker and easier. The UI has been designed to be usable and catchy at the same time. Try it out! Great work on this, I think it will become a default installation, very handy! I have an issue. I have extensions installed that provide events and datasources, which without the eudi, lets me view any documentation for how to implement them. The edui is not allowing me to view the documentation of these events and datasources. Includes designermonkey’s changes and some bugfixes. Starting from 0.5, it is possible to link/unlink datasource and events to a desired page through the With Selected menu. How about “All pages”? Could that eliminate the need for the Global Resource Loader extension?